I'm feeling much more prepared for class tonight! 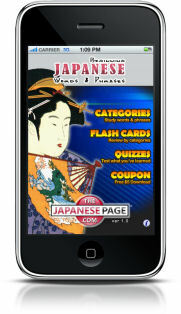 I found a terrific little iPhone app with Japanese flash cards and quizzes. There's a free version which nicely covers the sort of things you'd see in a first class on Japanese. The paid version is only $3.99 and has over 800 phrases. 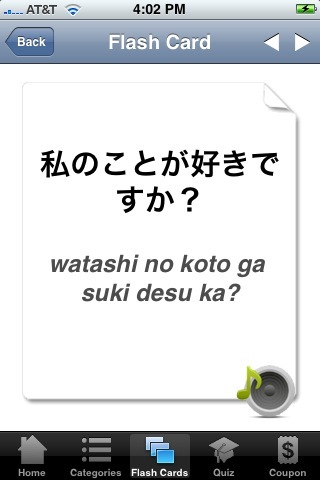 Besides the straight vocabulary drills, the app includes cultural notes and some articles on language basics. I was unfamiliar with thejapanesepage.com before, but I have found this app very useful. The voice recording is clear and understandable, and the flash card interface is very simple and easy-to-use. You can use the arrow buttons in the upper-right to page through the cards or you can "flick" the cards backward and forward. The only issue I found was in the quizzes. In one case, the application gave me duplicate options on the multiple-choice answers and counted my response as wrong. When reviewing your quiz results, it presents a list of the phrases you incorrectly selected from the answers. I think it would make a bit more sense to show the list of phrases that were the correct answers to the questions you got wrong. I wasn't aware of the duplicate choice in the quiz. Thanks! I'll let the developer know and see if he can't fix it.